Have diets you've tried in the past failed or even been counterproductive? Are you sure your diet is right for your blood type? This breakthrough program is the only diet book to reveal the hidden key to successful dieting. Your blood type reflects your internal chemistry and actually determines the way you absorb nutrients. The foods you absorb well and how your body handles stress differ with each blood type, and this plays a key part in losing weight, avoiding disease, and promoting fitness and longevity. 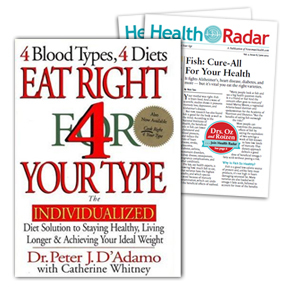 Based on that knowledge, Eat Right 4 Your Type provides a set of blood-type-specific diets to help you learn how to combine the foods that are right for you to ensure physical and mental well-being, while helping guarantee weight loss.